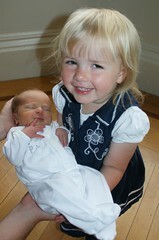 Mummy says I'm a big cousin now - this is the baby that Auntie Amanda had in her tummy until last Friday. He's called Alasdair Douglas (like Pumpa and Léon) Henderson (that was mummy's granny's name) Buchanan. He's very cute.